If there is one upside to Brexit, it is that it has made young people aware of how important it is they should engage with the political process. There’s no point complaining about the direction in which the country is heading if they haven’t made their voices heard – and, at the very least, voted. The extent of their engagement is, as with everything to do with Brexit, up for debate. Academic papers have already been written to establish whether it is fair to talk in terms of a “youthquake” – the Oxford Dictionary’s word of the year for 2017 – and Sloam & Ehsan, in an influential paper published in 2017, stated the statistics are subject to different interpretations. “Turnout did go up slightly in the sorts of places with lots of young adults – that does not necessarily mean it was those young adults doing the extra turning out,” it could only conclude. The British Election Survey (2017) was also inclined to dismiss any major increase in the youth vote as a myth and the regarded the increase as statistically insignificant. Critics usually cite the fact that young voters, aged 18-24, normally have the lowest turnout of any age group, which was particularly true for the General Elections of 2015 and 2017. As illustrated in Figure 1, the youth vote in these two elections was a dismal 43% and 54%, respectively (Ipsos Mori, 2015; Ipsos Mori, 2017). 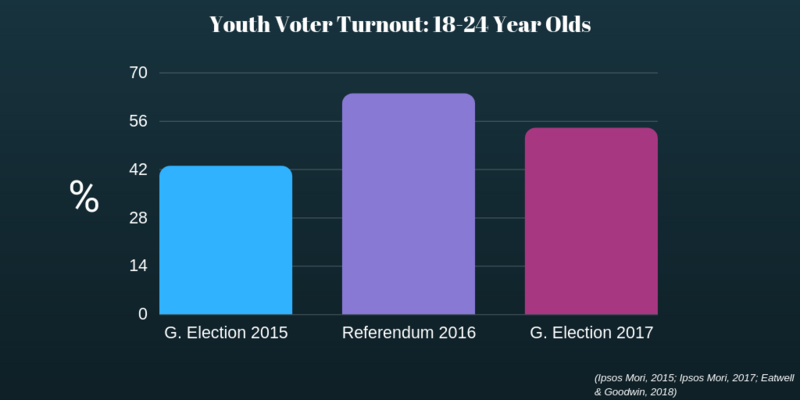 Figure 1: Youth Voter Turnout for 18-24 year olds at General Election 2015, Brexit Referendum 2016 and General Election 2017. But, this criticism does the young a disservice for two key reasons. Firstly, it disregards the role young people played during the Brexit referendum and in its aftermath. Secondly, it ignores and sidelines the democratic activities young people are engaging in beyond the ballot box (Martin, 2012). This criticism ignores the means through which young people exercise democracy. After all, democracy and citizenship are not solely about the ballot box. It is more than that. It’s about the process and the journey, rather than just the end product. To confront the critics it is imperative to make the point that more young people voted in the Brexit referendum in 2016 than in the two most recent General Elections in 2015 and 2017, as evident in Figure 1. In spite of a stressful exam season and horrible weather, young people were on June 23 electorally active. This suggests that when it really matters – and when the interests of young people are at stake – young people do actually turn up at polling stations to make their votes count and make their voices heard. In fact, 64% of young people aged 18-24 voted, with 75% voting Remain and 25% voting Leave (Eatwell & Goodwin, 2018). Although young people still had the lowest voter turnout on the day of the referendum, it was a major improvement and a huge step in the right direction. Given the low youth voter turnout at General Elections, youth participation in the referendum was revolutionary. Nonetheless, voting is just one part of politics. It’s not the be-all and the end-all. There are many other means through which youngsters can become active citizens. Young people, for example, are exercising their democratic rights and citizenship through alternative methods; namely, campaigning on single issues like Brexit, which dramatically affects them (Sloam & Henn, 2018). In fact, young people are exercising what is called “alternative politics.” This concept refers to political activities such as consumer boycotts, politics on the internet, demonstrations and campaigns (Dalton, 2008; Martin, 2012). One reason for this is that young people prefer to focus on a single issue that directly affects them, as opposed to joining a political party which is far too often like a broad-church (Kingman, 2017). Two examples ofalternative politicsare For our Future’s Sake (with the regrettable acronym FFS) and Our Future-Our Choice, organisations set up by young people in response to Brexit. FFS and Our Future-Our Choice are by young people, for young people and represent the interests of young people – as evident in the below campaign video by Our Future-Our Choice. They have done this via protests, contacting Members of Parliaments, educating people about the European Union, initiating discussions on social media and via digital campaigns. One video from a highly effective campaign group highlights how young people are engaged in politics – but simply through different methods. The hard work of these young people to secure a People’s Vote illustrates that they are not apathetic towards current affairs. Instead, they are active citizens because the establishment is alienating them with the prospect of a destructive Brexit. Although I am a non-voter myself due to foreign nationality, I still actively participate in politics through various other means, including: signing petitions, joining pressure groups, protesting, leafleting, canvassing for political parties and journalism, to name just a few examples. I have also helped to set up What is clear when I look around me at events of this kind is that it often isn’t necessary to be a citizen of a country to care passionately about it. What is clear to me is that the United Kingdom’s political leaders – and certainly the Labour leader Jeremy Corbyn – neglect the views of the young at their peril. Mr Corbyn should be reminded of the Liberal Democrats’ fate after they backtracked on their tuition-fees promise: an act that young people were willing neither to forgive nor forget. If, despite so many young people being so passionately opposed to Brexit, Mr Corbyn opts for a Lexit then a similar destiny could await him and his comrades. This would also have major implications for our wider democratic system. Any political party that is serious about engaging with young people has to offer, above all things, hope. Dalton, R. J. (2008) The Good Citizen: How a Younger Generation Is Reshaping American Politics. Washington: CQ Press. Eatwell, R. & Goodwin, M. (2018) National Populism: The Revolt Against Liberal Democracy. UK: Pelican Books. Ipsos Mori (2015) How Britain voted in 2015. Available at: https://www.ipsos.com/ipsos-mori/en-uk/how-britain-voted-2015 (Accessed: 14/02/19). Ipsos Mori (2017) How Britain vote in the 2017 election. Available at: https://www.ipsos.com/ipsos-mori/en-uk/how-britain-voted-2017-election (Accessed: 11/02/19). Kingman, D. (2017) Generation Remain: Understanding the Millennial Vote. London: Intergenerational Foundation. Available from: http://www.if.org.uk/wp-content/uploads/2017/10/Generation-Remain_final_October_2017.compressed.pdf (Accessed: 12/02/19). Martin, A. J. (2012) Young people and politics: political engagement in the Anglo-American democracies. London: Routledge. Available at: https://www.dawsonera.com/abstract/9780203112274 (Accessed: 05/02/19). Our Future, Our Choice (2018) Our Future, Our Choice [YouTube]. Available at: https://www.youtube.com/watch?v=2Me1ztt4i7k (Accessed: 29/01/19). Sloam, J. & Ehsan, M. R. (2017 Youth Quake: Young People and the 2017 General Election. London: Intergenerational Foundation. Available from: http://www.if.org.uk/wp-content/uploads/2017/11/Youth-Quake_Final.pdf (Accessed: 10/02/19). Sloam, J. & Henn, M. (2018) Youthquake 2017: The Rise of Young Cosmopolitans in Britain. Switzerland: Palgrave Macmillan. Available at: https://link.springer.com/book/10.1007/978-3-319-97469-9 (Accessed: 13/02/19).